It has been a while since the last time I posted my jeepney ride blog. I got busy with my wedding preparations and the different Christmas parties. Today’s jeepney ride is a different one. My co-passengers this time had been carrying a lot of baggages, either bags or boxes. One passenger caught my attention. He was carrying an Xbox game box. What is Xbox? Xbox is a video game console (modified computer system) created by Microsoft. It was first released on Nov. 15, 2001 in North America. This was succeeded by Xbox 360 which was released last May 12, 2005. It was estimated that as of June 2010, 41.7 million Xbox consoles were already released in the market. In terms of repairs, when you are encountering some problems with your Xbox, the first thing to check is if it is still under warranty. If it is, do not attempt to open it or else you will loose your warranty and the manufacturer or seller would not accept it anymore. If it not already covered by warranty, you can check out many online sites that give procedures on how to do your Xbox 360 repair. 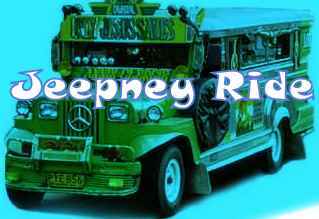 Jeepney ride is a routinary activity.Different passengers ride in it everyday. Today's jeepney ride, one passenger caught my attention. She wore a yellow fitting dress with black netted stocking matched up with dangling earrings and a heavy make-up. She is not a usual granny that you would met anywhere. She is one of a kind. I admired her strong will and determination to stay fit and young. Keep it up Granny. Jeepney is a public utility vehicle. It is the medium of transportation of people who belongs to the lower class of the population. It is also the source of income of jeepney drivers. Due to high price of fuel, only small amount goes to jeepney drivers after a long day of driving. Due to these circumstances, jeepney drivers neglect auto maintenance or repairs. Auto maintenance is vital in any passenger vehicle. Passengers' safety should be taken into consideration that drivers' must see to it that the vehicle is in good running condition. Passenger vehicles must visit auto shops once in a while. In choosing auto shops, drivers should see to it that it would maximize the money they pay like Dallas auto repair. They offer quality services to different cars even high class cars like Chevrolet Silverado,BMW, Ferrari, Ford and etc. Services offered includes brake job like brake pad replacement, overhaul, change oil, body tune and many more. Drivers must see to it that the auto shop they have choosen is not only affordable but also reliable.